Usually performed as a welcome ceremony, represents the dynamic character of the Surabaya community, it pictures the spontaneity of courageous knight. The accompanying gamelan musical intruments include gending, bonang, saron, gambang, gender, slenthem, zitter, flute, ketuk kenong, kempul and gong.The tunes are Jula-Juli Surabaya, Tropongan, sometimes continued by Walang Kekek, Gedog Rancak, Krucilan or new creations. The Remo dance has two styles, boyish or girlish. Accordingly the dancers are boys or girls, it may be performed singly or in a group to welcome as a honor of guest and visitors. It may also and serve as an opening dance of the Ludruk performance.The dancers wear three kinds costumes, the Sawunggaling or Surabaya style. The upper part is black, representing an 18th century noble dress. 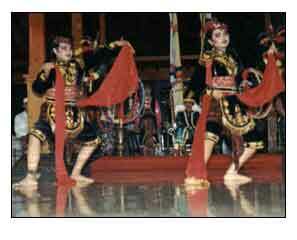 The trousers are black velvet with the golden ornament and batik.The Remo dance was particularly promoted around 1900,it was utilized by the Indonesian nationalist to communicate with the community.